When Isabella wrote Interrupted in 1881 she was forty years old and had lived through one of the greatest financial disasters in American history. It was a troubling time for the country, and Isabella reflected that trouble in her story. The main character, Claire Benedict, is a young woman raised in the lap of luxury, who suddenly finds herself—along with her mother and sister—virtually penniless when her father dies unexpectedly. How do such things occur? I cannot tell. Yet how many times in your life have you personally known of them—families who are millionaires today, and beggars tomorrow? It was just that sort of blow which came to the Benedicts. Isabella had seen real-life examples of wealthy businessmen turned into paupers overnight. 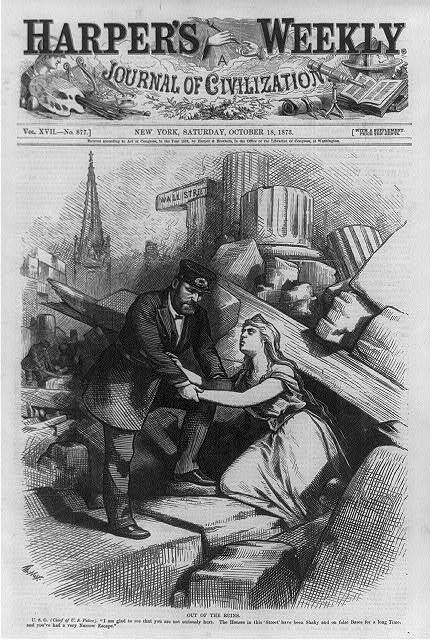 Just eight years before Interrupted was published, America suffered through The Panic of 1873. 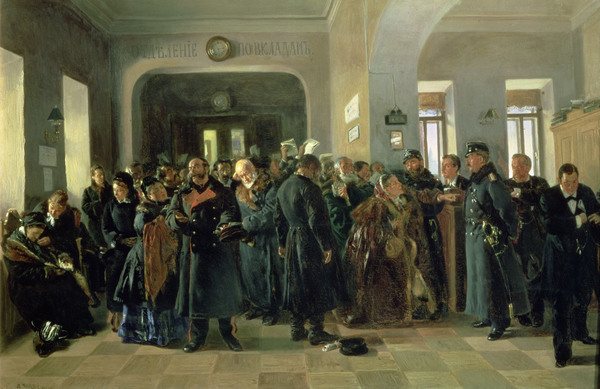 The Collapse of a Bank by Vladimir Egorovic Makovsky. Note the despair of the man in the center of the painting, compared to the bank manager on the right, pocketing cash as he heads for the exit. 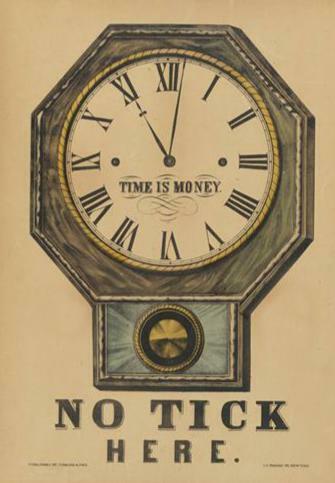 The Panic was caused by many factors, but the fatal spark came from Jay Cooke & Co., an American banking house that borrowed heavily to finance railroad expansion in the U.S. 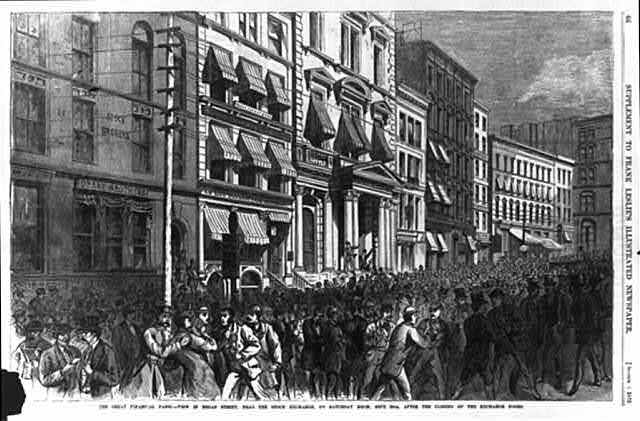 Newspaper illustration showing crowds gathered outside Jay Cooke & Co. banking house in September, 1873. 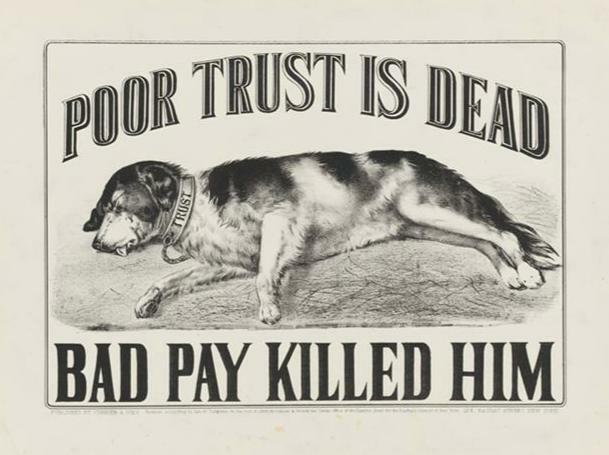 Cooke was caught using a number of deceptive business practices, including shell companies to hide costs from investors, a scheme discovered in 1872. 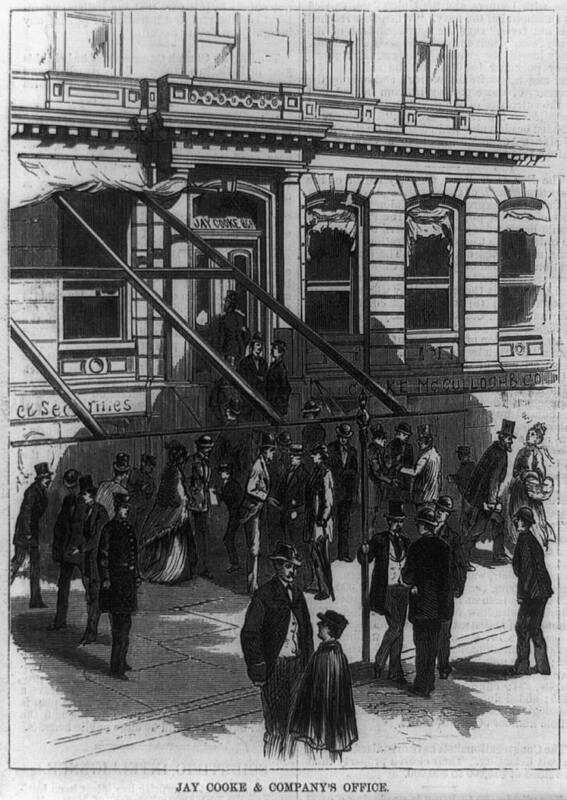 The revelation damaged investor confidence, and Cooke’s bank suffered heavy losses until, in 1873, Cooke was forced to suspend all deposits and payments, and closed the bank’s doors. 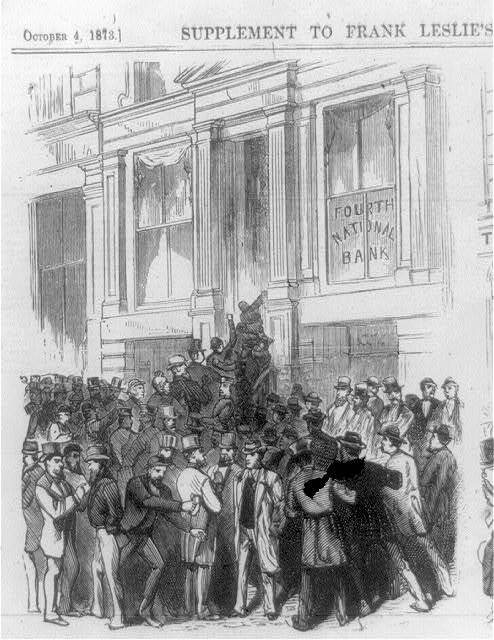 A run on the Fourth National Bank, New York City, 1873. 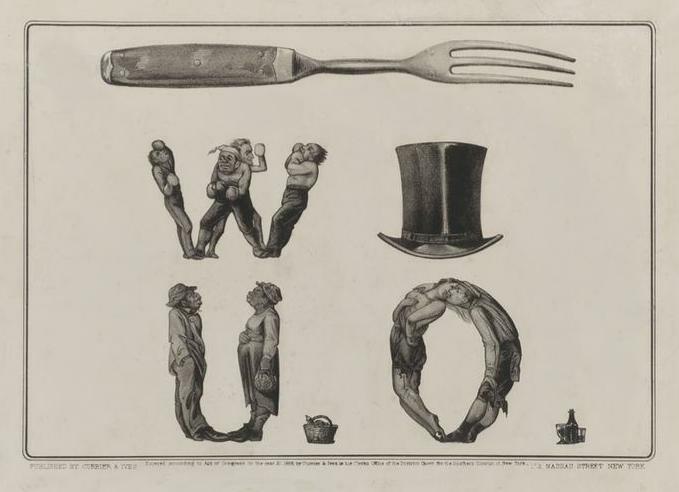 From Frank Leslie’s Illustrated Newspaper. That announcement sent shock-waves through Wall Street, and led to a panic of bank runs and bank failures throughout the country. The extent of the economic crash was so great, the New York Stock Exchange closed two days later and stayed closed for ten days. Crowds on Broad Street near the Stock Exchange on September 20 after the closing of the Exchange doors. Those banks that survived the initial crash immediately called in their debts, which caused an alarming number of foreclosures and bankruptcies throughout the country. The Panic of 1873 commenced on September 18; by and the end of the year . . . Retailers did their best to keep their doors open. Many abandoned attempts to make a profit and had to be content to merely break even. Advertisement in a Philadelphia newspaper. It was a desperate time in America; and the economic depression that followed the crash lasted almost seven years. As the economy began a slow recovery, the average Americans found the financial rules had changed. 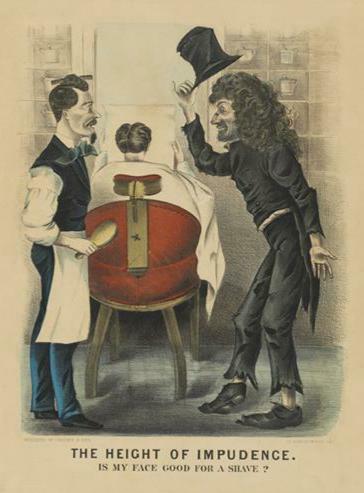 The cover of Harper’s Weekly magazine on October 18, 1873. For starters, there was a lopsided disparity of wealth distribution. Rich industrialists like Andrew Carnegie and John Rockefeller, who survived the Long Depression intact, now owned over 71% of the nation’s wealth. A merchant’s sign proclaiming their cash-only policy. The average American found banks no longer wanted their business. J. P. Morgan’s banking house required a minimum personal value before they allowed a new customer to even walk in their door. 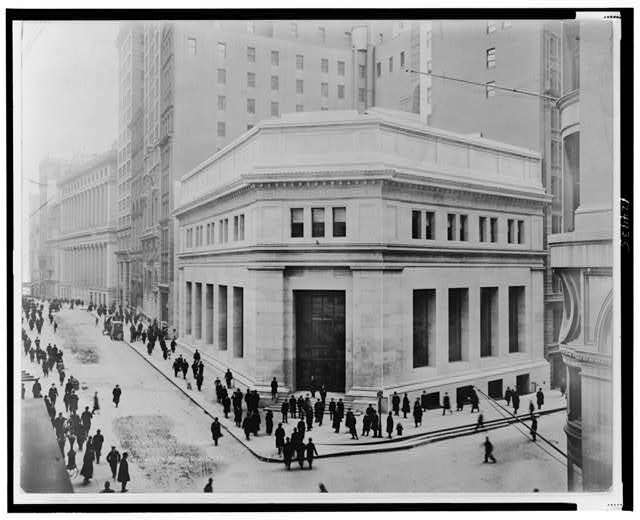 The J. P. Morgan Bank building at the corner of Broad and Wall Streets, New York, as it appeared in 1914. So Americans had no choice but to turn to cash. 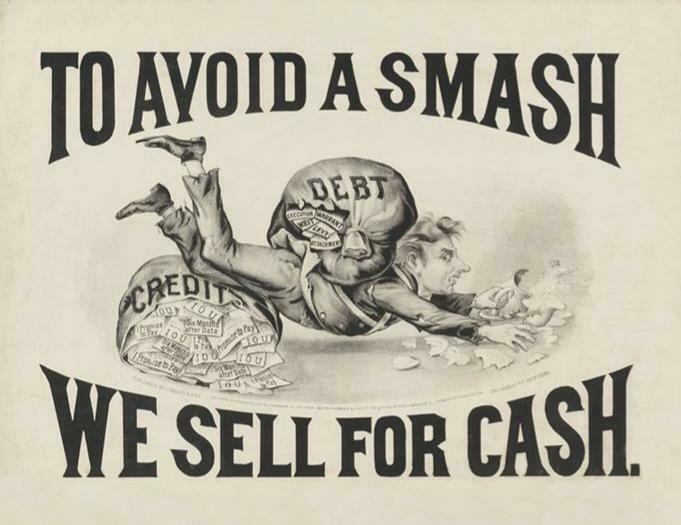 It was a natural reaction, since most Americans were aware that buying on credit and shady financing deals had caused the Panic of 1873 in the first place. They came to distrust credit and lending institutions, and developed their own barter systems and cash-only policies. 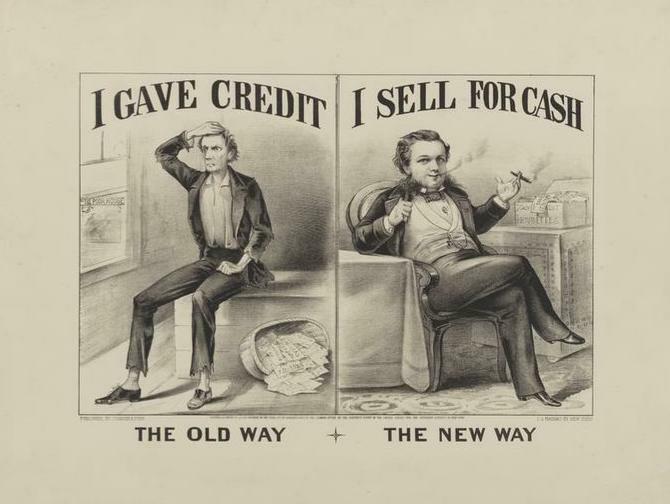 A cartoon illustrating America’s altered attitude toward credit. Isabella wrote about it in The Pocket Measure. In that story, Mrs. Spafford suggests to a group of girls from church that they earn money by starting a business selling hand-made items. A merchant’s broadside from 1875. Her characters saved up for years to purchase a train ticket or a new dress. Another example of a merchant’s broadside. They counted pennies and survived on johnny cakes and molasses. In fact, most of Isabella’s stories feature characters who live in poverty—the sort of poverty Isabella witnessed first-hand in the years following the 1873 crash. Do you have a favorite Isabella Alden book that features characters who were poor or insisted on earning the money for the things they wanted to buy? Share your favorite Isabella book by commenting in the Leave a Reply box below. And you can click on any book cover to find out more about Isabella’s novels mentioned in this post.